Cinco de Mayo is a delicious way to celebrate amazing Mexican fare and rejoice in sunnier days and warmer evenings, now that Spring is finally here. Start with some vibrant colored decorations to outfit your backyard or adorn your dining room table. Kick off your Cinco celebration with flavorful blender drinks made with the real stuff like pomegranate and berries. Store-bought drink mixers are full of HFCS, artificial colors, and other preservatives that just make them taste fake, while packing on an extra 100 to 200 calories per cup. 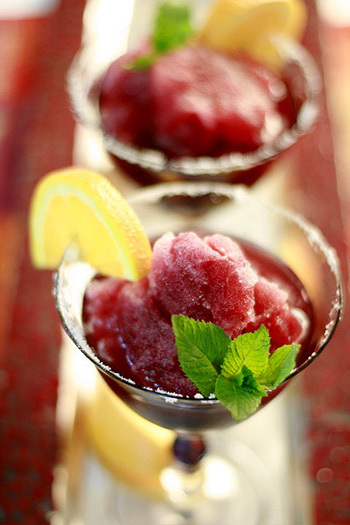 It’s just as easy to make your own Pomegranate Margarita, with real pomegranate juice. For something fresh, try making a Watermelon Grapefruit Aqua Fresca, made with pink grapefruit. Combine 4 cups fresh cubed watermelon with 1 cup pink grapefruit and 8 ounces of the liquor of your choice in a blender and process until smooth. Set out a large bowl of freshly sliced limes for a refreshing way to garnish your selection of drinks. Include this “booze free” aloe spritzer for partygoers who don’t drink. The best (and healthiest) way to celebrate is to throw your own bash with homemade Mexican dishes that are naturally healthy. Start your meal off with a soup! 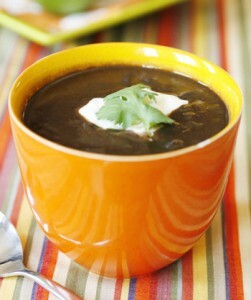 Naturally creamy Black Beans Soup can be made several days ahead and served hot or room temperature. I consider beans (especially those with dark black or red skins) to be the unsung heroes since they are loaded with fiber and anti-oxidants and compare to blueberries on the ORAC scale. Guacamole (served with veggie sticks instead of chips) is a rich tasting dip that’s incredibly healthy: Avocado is rich in the good kinds of fat that can keep you feeling fuller and may even keep wrinkles at bay. And fiber-rich avocado can fill you up fast. Or try these rich tasting Chipotle Orange Shrimp: Shrimp is a superfood that is a great source of iodine, a mineral essential for proper thyroid function. Don’t fear the dietary cholesterol in shrimp, studies show that it won’t tip the scale when it comes to blood serum cholesterol. Spicy Chipotle Chicken makes a great main dish, marinated in healing chilies that have a wide range of health benefits — including weight loss and calming inflammation. Chicken Enchiladas are a family favorite that you can actually bake on your grill. 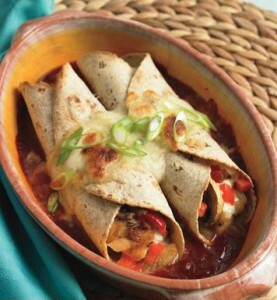 Instead of heating up your oven, prep the enchiladas in an oven-safe dish. Place directly on the grill grates –uncovered, then grill for about 5 to 10 min and serve. For tasty sides, serve up a side of these tasty yucca fries that are surprisingly high in vitamin C and contain some fiber. Or go for this vibrant watermelon tomato salad that makes a refreshing quick side dish and is light in calories. Here are two sweet finales that you can make up to three days prior to your feast. Mexican Wedding Cookies or dark chocolate sorbet with spices make for a sweet finish to any meal, made with fiber-rich nuts and 100% unsweetened cocoa, a chocoholic’s dream. Pack the cooled cookies in an air-tight container and store on the countertop until guests arrive. Store the cooled sorbet in an air-tight container in the freezer. Thanks for nice recipes! It looks so healthy!